A new technique that captures and processes 3D images instantaneously has scooped the Vision Award at this year's Vision Show, held in Stuttgart on 6-8 November. UKIVA announces new Machine Vision Handbook; Oki Electric Industry awarded 'Product of the Year' award by the Information Technology Promotion Agency in Japan; and Andor Technology has been listed in the Deloitte Fast 50 ranking. Specialised Imaging has launched a new website; Moritex has released a new user guide to borescopes; and Forward Vision has appointed a new marketing manager. Allied Vision Technology has expanded its R&D labs; Carl Zeiss and Logitech collaborate on video conferencing technology; and Carl Zeiss wins an award for its microscopes. A new module on the characterisation of linearity, and the associated errors, has been added to the EMVA 1288 Standard, which describes how a manufacturer must detail the specifications of vision equipment. 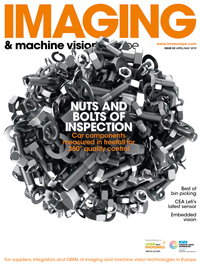 Firstsight Vision has published two new 'Tech Tips' on its website to explain the use of telecentric lenses and choosing lenses for infrared imaging systems. It's official - Germany are the football world champions - in RoboCup at least, the world championship for robot football, which took place this July in Atlanta, USA. A project to develop a new kind of scanner that could aid cancer diagnosis and treatment has received a £325k grant to help make the new technology available for general use. The Stemmer Imaging Group is to distribute Opgal Optronic Industries' thermal imaging equipment and infrared sensors in Europe. Thermal camera manufacturer Flir Systems plans to buy a controlling interest in Cedip Infrared Systems. Following completion of the move, Cedip's infrared cameras will be integrated into Flir's product range.